I’m going to get a little personal here and share a story about my latest knitting project. I hope you’ll all be kind. It wasn’t my first time knitting, but it certainly felt like I was learning to knit all over again. 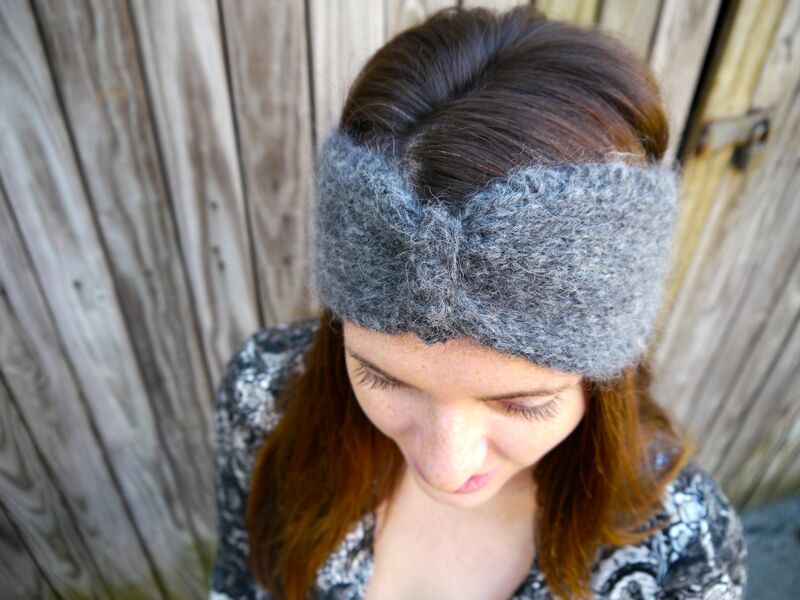 Last week I started working on the beautiful headband Ryll from booklet #323 Berroco Cirrus. It had been a few months since I’d knit anything and almost a year since I’d knit something that required more than a Stockinette stitch. Still, I thought it would be a piece of cake. This is what it looked like last Wednesday. Too bad the pattern didn’t call for any Reverse Stockinette stitches. Norah & Amanda were kind enough to hide their laughter. I had made a few mistakes. Sure, it was embarrassing to mess up these knitting basics. After all, I first learned to knit more than a decade ago. But I was easily frustrated by slippery stitches and the unnecessarily cumbersome needles that I’d borrowed from my mom. So for years I focused on crochet – only knitting when I saw a pattern that I couldn’t convert for my hook. I guess it was silly to think I could throw myself into any easy knitting project without a few refreshers. Luckily, my co-workers are not only excellent teachers, they’re also very patient! I tried to tear out the bad stitches, but it wasn’t easy. The halo of fibers that make Berroco Cirrus so soft and beautiful also make the process of undoing mistakes a bit time-consuming. So I started over and finished my headband this past weekend. What do you think? I tried to copy our model’s pose but I’ve never been good at taking serious photos! Whether you’re new to knitting or learning to knit again (like me), I hope my story is a reminder that it’s always a good idea to ask for help. The Berroco Design Team is a great resource for us all. You can check out our library of How-To Videos or if you don’t see the stitch you’re struggling with, you can always email: patternsupport@berroco.com. 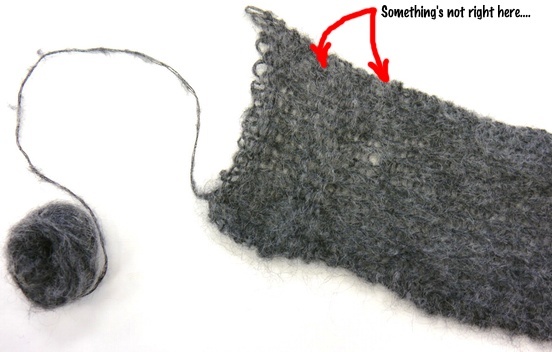 Feel free to share stories of your beginner knitting mistakes in the comments. I’d love to know I’m not alone! Thanks Kristen! Getting started is the hardest part. Now I can’t wait to start another project! About two weeks ago I started a shawl that’s mostly stockinette with a lace border. I’d knit the pattern twice before and got two beautiful shawls in a relatively short time with no major glitches. Well, the third time into that pattern was a nightmare. The half-done shawl was full of twisted, reverse stockinette, and dropped stitches and the stitch count was way off (this was in the stockinette portion before even starting the lace). I frogged and started over. Same problems. Frogged again. Even worse screw ups after starting a third time. Frogged one last time. The yarn just does NOT want to be that shawl (it couldn’t possibly have been me, could it?). The yarn’s been put aside now to be tapped for a different project later. Some projects just seem meant to be and some aren’t. If things keep going horribly wrong (as with the shawl), it could be time to rethink and regroup. Knitting or crocheting disasters can happen to the most experienced of us at any time. The key is to not let them get us down, then move on to something else. Don’t think of it as a defeat. Instead, think of it as a judicious use of knitting (or crocheting) time. I’m glad I didn’t give up on this one, but you’re right, some projects aren’t worth the frustration. You can always find new projects for good yarn! Great read Ashley – you had me giggling the whole time! I’m in a reverse situation than you in that I’m crocheting again for the first time in…um…I dunno…6 or 7 years? I’m making a Tunisian Entrelac afghan and so far there are 2 oopsies, both noticed a row of blocks later. I’m leaving them and referring to them as “design changes”. I’m fond of “design changes” too! They help personalize the project. Thanks for sharing! Ashley, if it makes you feel any better…..mistakes, and just like the ones you made, aren’t necessarily limited to beginners…….I’ve knitted the very same baby blanket over 50 times, and it’s my own design, so I can’t blame the designer….every blanket or so, I get some strange looking trellis pattern. The first few times, I frogged and corrected. Now I just cover the mistakes with little crocheted posies. Folks think I designed it that way. Nobody knows. Just me. And now you. Second go around turned out beautifully…good job! Thanks Susan! It sounds like your blankets are lovely with or without the added posies! 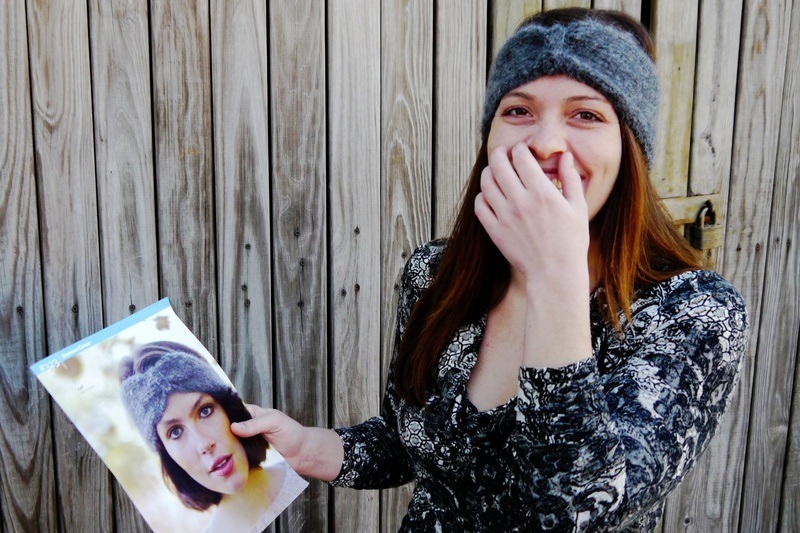 Well your headband turned out super! Yeah for Norah and Amanda! Yeah for not giving up! Thank you! I know I’m lucky to have such experienced knitters helping me. I’ve been knitting and crocheting since I was in junior high. Sometimes I need to refresh my memory on knit casting off. This year I completed a beautiful cowl and debated about whether to keep it myself or give it for a gift, but I thought I got tons of yarn so I gave it as a gift. What a beautiful feeling knowing that I have completed a project for a gift that soft and warm for this chilly Minnesota weather. My recipient put the cowl on immediately on top of her scarf I made for her last year and had the biggest smile. I’m a happy person today !